Stick with me throughout this tutorial, okay? You’re going to learn a lot. Take it step by step, and trust me — it’s way easier to build a website nowadays than it used to be. Thank goodness we’re not in 2001 anymore, amiright?! Step 1: Choose a hosting provider. A hosting provider is your safe place to park your domain and build your website. You want to choose a good one. For reliable hosting, our first recommendation is Bluehost. Why? Because they really make it a no-brainer for freelancers to build websites. They have a 30-day, money-back guarantee, too, so if you don’t like it, you haven’t lost anything. 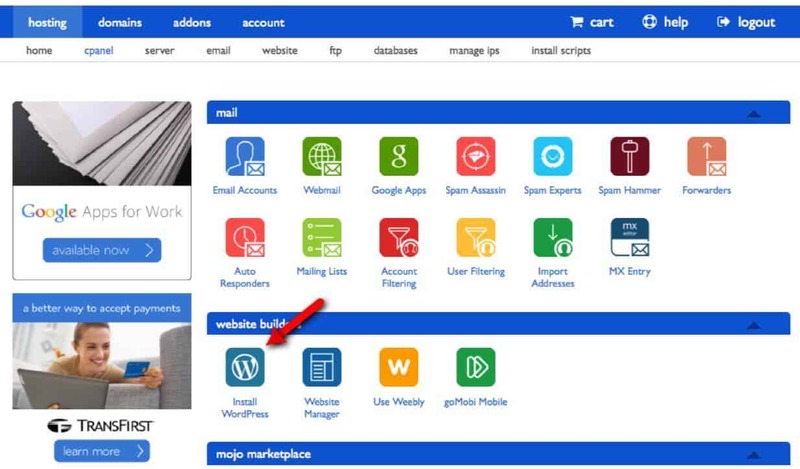 Best of all, with Bluehost, you can get a FREE domain and access to a free website builder. Bluehost has a host (HA!) of plans to choose from. I recommend the Starter option for your basic freelance website. If you’re going to be using this website to build a gigantic blog with lots of posts, advertising, and visitors, go for the Standard or above. PRO TIP! Go for the yearly plan, not month-to-month. You get the free domain with the 12-month plan or longer. The 30-day money-back guarantee still applies, and if you decide to cancel before your year is up, you’ll get back any unused months you paid for. So there really is no risk. Paying ahead also means you don’t have to worry about your website being taken down every month if your credit card number changes or gets declined for some reason. After choosing a plan on Bluehost, you’ll be able to choose your domain name (which is included for FREE in your annual hosting plan) — either a brand new one or you’ll have the option to transfer one you’ve already purchased. If none of the options you want are available, try adding a keyword specific to your niche onto the end of your name, as in caitlinpyleproofreader.com or johnsmithbookkeeping.com. You could also use a “.net” or “.biz” domain, BUT just keep in mind that most people automatically type in “.com” before even thinking of other endings. Keep in mind the type of services you’re providing. If you’re offering more than one service, you don’t want to limit your audience by creating a domain name that focuses on one specific area of your niche. It’s always a good choice to own your own “name” as a domain. Once you’ve settled on your domain, don’t wait to buy it. Even if you’re not ready to set up your website right now, you don’t want to risk losing the domain you want. Why Should I Have a Personalized Domain? What’s the advantage of a personalized domain over a subdomain (like benjaminpyle.blogspot.com)? Because subdomains are not as polished and professional looking, and if you use a “free site builder” without your own domain, you’ll be left with ads at the bottom of your website. Yes, a free site with tacky ads is better than no site at all, but ads can slow your site down and call into question whether you’re a real business. Purchasing your own domain is so inexpensive (and tax deductible!) — there’s no good reason to not have one. Ask yourself: would you view The Work Anywhere Life as a lesser business if my website was theworkanywherelife.freesite.com? You probably would. Your own “dot com” legitimizes you far more than a subdomain ever will. What if it had ads on it like this? See what I mean? Custom domains are essential to projecting a professional business image. PRO TIP! With your own hosting and domain, you also get your own email address with your domain — not just a Hotmail, Yahoo, or Gmail address. A real domain email address SCREAMS “I’m a real business!” As you can see in Step 2, 100+ email accounts are included in your hosting plan — you only need one! — and did you know you can use your FREE Gmail account to send and receive with your personalized domain address? See Google’s step-by-step instructions to set this up when you’re ready. I know it may be tempting to pinch pennies when it comes to this kind of thing, but remember: it’s tax deductible and you’re investing in the professional image of your business. It’s worth it — and if one client stays on your website longer or decides to contact you because of its fast loading time and super-professional look, it’s definitely worth it. I don’t think using a free site with a subdomain (and tacky ads!) is worth the risk of looking cheap or unprofessional. If you’re not sure you’re going to be doing the same type of service forever, be “safe” when choosing your domain, and just go with your name. This is an easy step! Don’t worry; they’re not trying to steal your identity! is a legit, award-winning hosting company whose very livelihood depends on their clients’ security. After you provide your contact info, you’ll have a few options to choose from. You can stick with the basic package at $3.95/month ($47.40 per year gets you the free domain), or you can choose to add on some extra security features. You don’t pay for them unless you choose them, and I encourage you to click the “More information” button to see if it’s something you feel you need or not. If you’re unsure, just remember these features are always something you can add on later. Congrats! You just got your domain and hosting. You’ve reached a crossroads! The rest of this tutorial will go over how to install WordPress on your new domain, but Bluehost also has a few other totally free website builders you can use — these website builders do not add tacky ads on your site. Here’s a screenshot of where you’ll need to go once you’re “inside” your hosting account. You’ll need to click “hosting” in the blue bar, then “cpanel” in the bar below it. WordPress is the bomb. And it’s free (people who say it’s not are probably referring to the need to have a hosting provider and a domain in order to use the WordPress.org system 🙂 Just ignore them. Using WordPress on your domain will ALWAYS be free!). So this is the screen you’ll see right after clicking “Install WordPress” in Step 7 above. 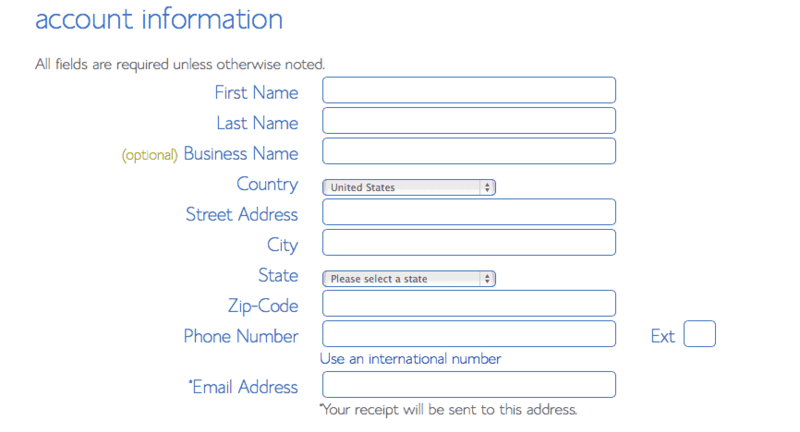 … then give your site a title + enter your Admin details. All of the Admin details can be changed later under Settings –> General in your WordPress Dashboard. 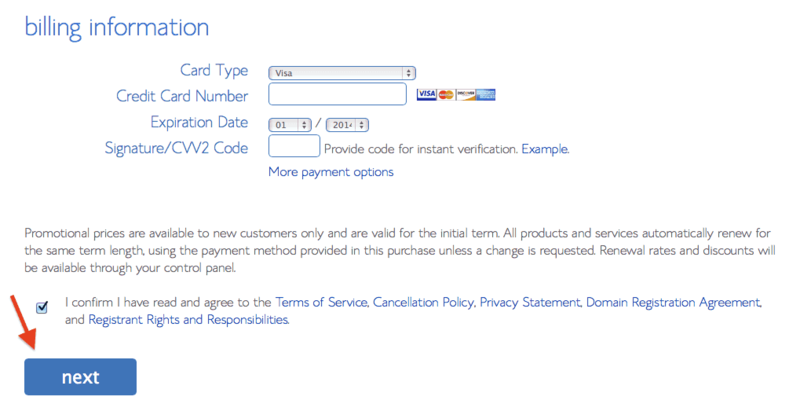 Click the box to indicate you’ve read the terms and conditions, then click “Install Now”. This is the screen you’ll see after you click “Install Now”. That’s it! You’ve got your website up and running! 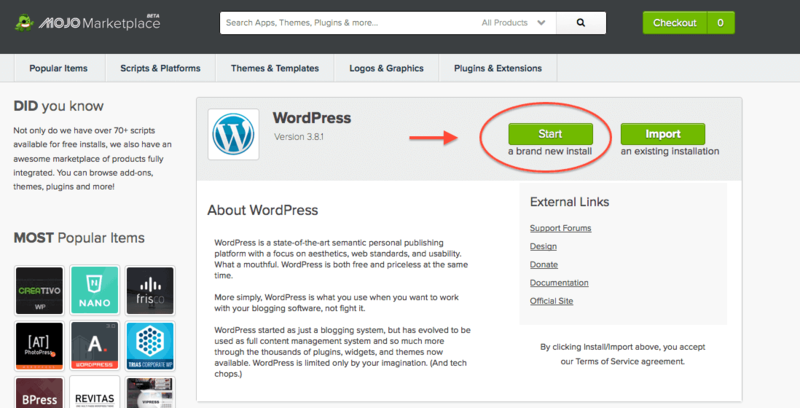 Once WordPress is installed on your site, the fun begins — now you can start customizing it!! BUT FIRST… let’s go through some WordPress navigation basics. 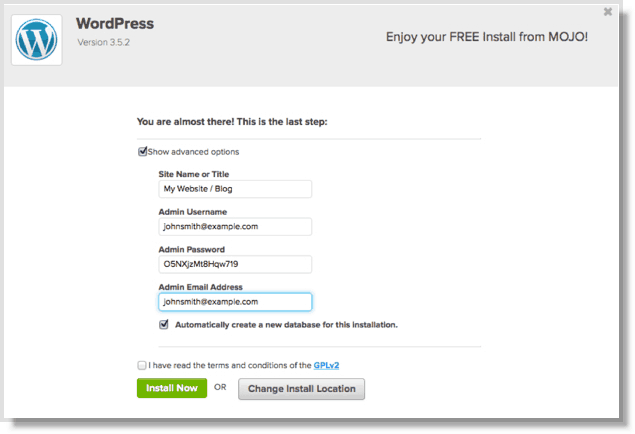 Signing in: When you install WordPress in Step 8 above, you’re going to get an email. This email is important! Save it. It contains your unique WordPress login URL which is how you’ll access your site in order to start customizing it. Adding a New Post or Page: Once you are logged in, you’re in the “Dashboard.” In the left-hand side, mouse over to Pages and choose “Add New”. This process is the same for posts (if you choose to blog on your site); just choose Posts and “Add New” instead. Adding Images: Go to “Media” in your Dashboard area and click “Add New”. To get your image into a post or page, you’ll need to go to that Post or Page and click the “Add Media” button. Make sure your cursor is blinking where you want the image. Adding Sidebar Stuff: Mouse over to “Appearance” and click “Widgets” — this will allow you to add nifty stuff to the sidebar of your website (more on that later). Don’t worry too much about this stuff yet until you’ve chosen your theme. Definitely take some time to click around on things on your new WordPress site. “Just doing it” isn’t some lame marketing slogan — it’s true! Learn by doing. While working on your new website, put up an “under construction” or “coming soon” sign to greet any visitors. It can take some time for Google to index your new site, but you don’t want any potential clients or readers to Google your name and find a half-finished site. To set up a little sign that says “under construction,” just go to Plugins –> Add New in your Dashboard and search for Under Construction. Choose the plugin with the highest star rating and you’ll be good 🙂 You can even include a link to your social media profiles on your Under Construction page — that way, visitors have an alternate way of getting in touch with you. When you’re ready to share your website with the world, simply deactivate and delete this plugin (to do this, go to Plugins –> Installed Plugins). Now we’re getting to the fun stuff! Your theme determines what your website actually looks like, and you’ve got a lot of options in this department! Yes, there’s a wide range of free themes, but if you’re serious about this website, the customization and support offered by paid themes can’t be beat. When I first started building my own website, I used a free theme, and I didn’t even have the option to upload my own logo! On The Work Anywhere Life, I use Rise by Thrive Themes, which has a great look and support team. Thrive has a wide selection of gorgeous themes at very reasonable prices. If you truly want your website to look professional, it’s worth it to create a custom logo. You can ask your favorite graphic designer or create something yourself with PicMonkey. The easiest option? Order one on Fiverr if visual design is not your strong suit. Use your logo in your emails, your Facebook profile, and of course, your website! About: The about page is frequently touted as one of the most-viewed pages on blogs, so don’t overlook it. Include a photo and brief bio. Be sure to clearly state what you’re offering. What makes you an expert? How can you help them? Don’t be afraid to let the “real” you shine through — websites are personal, and being weird is cool! Remember this post? Services: What are you offering? Describe it in detail here. Screenshots or examples of what you can do are also great to include here. 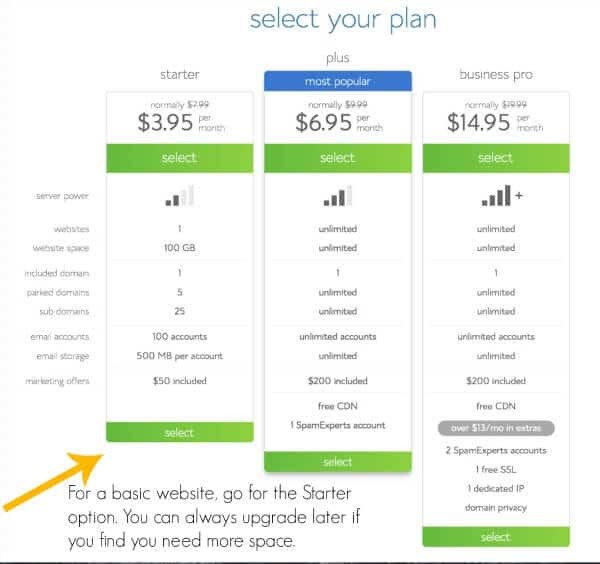 Rates: You can combine this with the Services page or make it its own separate page. Create a table of your services and rates together. Take a screenshot of your table and crop it as needed using a free photo editor. You can even add frames! Reviews: Are people happy with your work? Awesome! You can create a page or a post with comments enabled in WordPress and invite your clients to leave comments about your work. PRO TIP! Once you’ve set up all your pages, make sure they’re visible on the home page. If they’re not showing up, you may have to adjust your menus. Unless you prefer to show off your latest blog posts on the homepage, you will want a “static” homepage, and you’ll need to choose which page you want to be your homepage. Check out this WordPress tutorial on how to set it up properly. Plugins are what expand WordPress’s functionality. They’re especially useful for people like me — the type of people who aren’t so comfortable with the technical stuff but who’ve still managed to set up a self-hosted website. Think of them as apps for your website: they’re free tools you can install to add function to your site. These are three plugins that will help you maximize your website’s effectiveness — for free! Yoast SEO: If you’re blogging on your freelance website, look into this one. This all-in-one SEO plugin helps you optimize your post content, upping your chances of getting organic traffic from search engines. If your blog has a sidebar, you might want to spruce it up with a few widgets, which are the nifty thingamabobs on the right- or left-hand side of your page. There are some widgets built in to WordPress; others you can download as Plugins. My favorite is Image Widget — you can easily upload an image and turn it into a clickable button. Don’t forget social media icons! Make it easy for your visitors to find and follow you on social media by including links to your profiles in the sidebar. Here’s a basic tutorial for adding custom social media icons. We use and highly recommend Social Warfare! This may not seem like something to be concerned about, but that’s just because you haven’t experienced the sweaty palms and racing heartbeat when you think your site has crashed and you don’t have a backup! All your hard work — gone in an instant. Free options to back up your site are out there, and something is better than nothing. More robust, backup options include VaultPress, BackupBuddy and blogVault. Once you’ve finished your website design and content, make sure you have it proofread for any stray errors! Even a single typo or poor grammar can cost you a client. Don’t skip this step! Don’t forget to submit your URL to Google for indexing. Put your website address everywhere. This is another big reason you want a personalized domain — weareawesome.freewebsitebuilder.com doesn’t look very professional plastered all over your social media or email signature, does it? One of my favorite things to do is doctor up a professional profile photo using PicMonkey. If you feel super stuck at any point, you’re not alone! You can also comment on this post, and I’ll do what I can to help!